It seemed to me quite quintessentially British, this place. The white middle classes thronged, generations of them — I suffered a little class anxiety but I am always made happy seeing grandparents out for the day with their grandchildren I confess. There was tea, and I had some quite nice cake that I took away wrapped up in a napkin that involved zucchini and cream cheese frosting. There was a lovely garden, despite the time of year, with an offering of a number of well marked flowers and herbs. My love of plants has never yet led me into an herbarium, but I discovered their massive collection of beautifully pressed plants, preserved for study in rows of custom built containers, and frozen now and again to ensure there are no insects feasting on them like aged cheddar. They also had a lovely library with the most wonderful books lining the walls, and treasures in these giant old herbals lying open on the table. 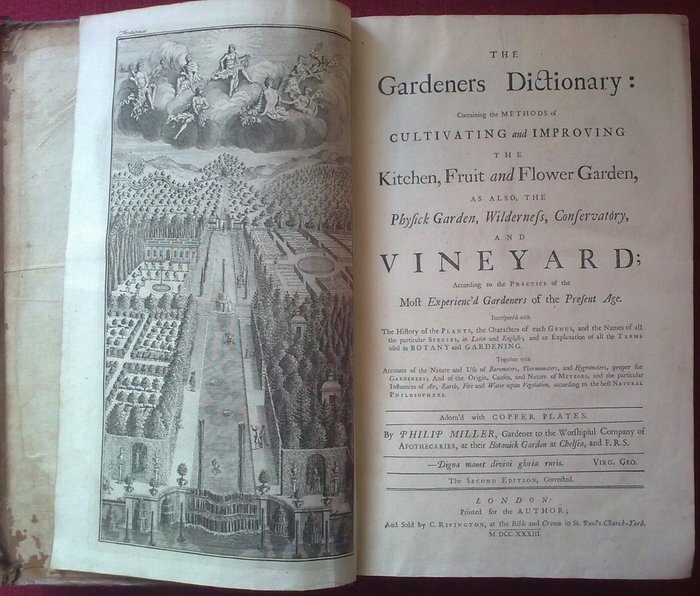 First, The Gardener’s Dictionary: containing the best and newest methods of cultivating and improving the kitchen, fruit, flower garden, and nursery, as also for performing the practical parts of agriculture, including the management of vineyards, with the methods of making and preserving wine, according to the present practice of the most skilful vignerons in the several wine countries in Europe, together with directions for propagating and improving, from real practice and experience, all sorts of timber trees . 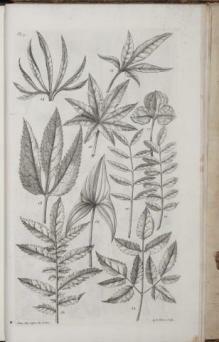 Put together by Phillip Miller, curator of the Chelsea Physic Garden, the first version was published in 1731. 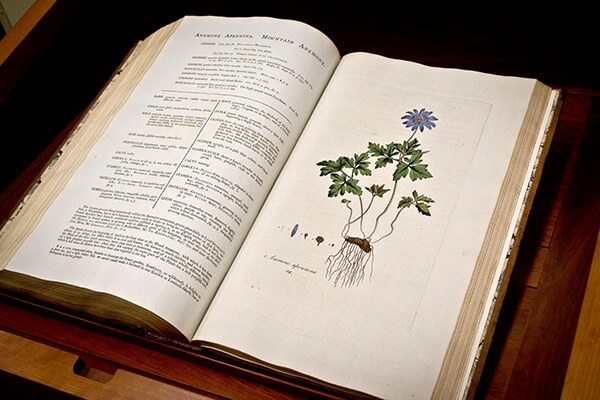 It was a foundational book in forming the knowledge, practice and taste of gardening, or so it is said by the wonderful University of Toronto’s Thomas Fisher Rare Book Library, where you can see all of it . One of the other books was entirely London plants, a beautifully illustrated financial disaster: The Flora Londinensis [electronic resource] : or plates and descriptions of such plants as grow wild in the environs of London: with Their Places of Growth, and Times of Flowering; their several Names according to Linnaeus and other Authors: with A particular Description of each Plant in Latin and English. To which are Added, Their several Uses in Medicine, Agriculture, Rural Oeconomy, and other Arts. 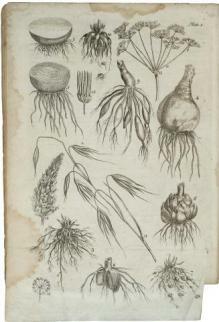 By William Curtis, Demonstrator of Botany to the Company of Apothecaries. Again, based in Chelsea. A wonderful description of the book and its publishing can be found here. The pictures are exquisite, as is the book. Financial disaster came because the book proved expensive to publish and not a big seller. The public was not interested in local flora, desiring pictures of the bizarre and the exotic instead. His natural history collections from India were legendary, with the bird and animal collections being presented to the British Museum Natural History as it was then called. Back in England, with help from his friends, he immediately started collecting British plants. These collections form the nucleus of the Institute herbarium. He also designed the herbarium cabinets. The library was started with books owned by him. The garden was to be used partly to grow alien species missing from the herbarium. We do not know whether there was an original conservatory: the present one replaced the existing one, riddled with dry rot, in 1990. This was made possible with a grant from the Stanley Smith Horticultural Trust. The Institute was cared for by resident curators. It is interesting to speculate on why such a very distinguished and energetic man as Hume should have spent his final years, then aged over 80, pursuing such an unusual aim. According to the original Memorandum of Association, ‘The sole object for which the Institute is established is to promote, encourage and facilitate, amongst the residents of south London, the study of botany exclusively’. I wonder what it meant to him to return to his own country, specialise in its own plants in a way that the explorations in service of empire demanded abroad. Hume’s history in India seems to be one of liberal action pushing democracy and improvement as far as the framework of empire would go, founding free schools and promoting agricultural improvements. Not radical enough to challenge the empire itself, he did enough to earn himself a demotion and eventual dismissal. So I like him. 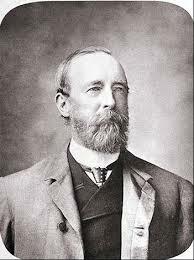 He also went on to help form the Indian National Congress…there are a number of interesting talks to be found on his role in India and his ornithological and botanical interests here. It somehow all came to rest in this place, on Norwood Road. This is an interesting place to think through some of London’s connections to Empire, our natural love of, and curiosity about, the incredible world we live in, and how it can be structured and appropriated by imperialism and exploitation. The role of botany and cataloguing and scientific exploration in conquest as well as furthering human knowledge. The corresponding influence of a role as civil servant and political figure in the pursuit of natural history and collecting. 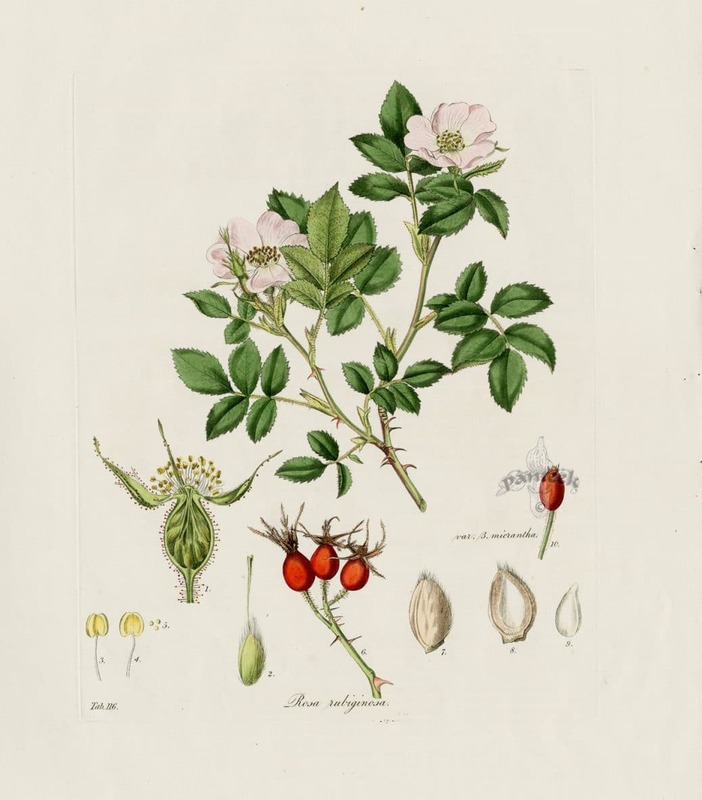 The study of botany and the collection of plants are irrevocably tangled in these imperial histories, even when not as tied to such a career as that of Allen Octavian Hume. There is so much more to explore here, and there is a little more here.